The sibling relationship is often the longest lasting family connection. Children growing up together in a home spend a significant amount of time with each other. This shared time builds a special relationship and connections that last a lifetime. 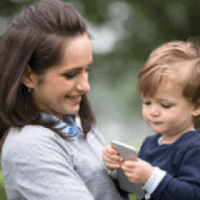 When a child has a developmental delay or disability, the sibling relationship can have an even greater impact because connections with other children may be more difficult. Children in early intervention can learn a lot from their siblings throughout the day in a variety of situations, such as meal time and play time. For their brothers and sisters with disabilities, siblings may fulfill many roles: friend, teacher, role model, and supporter. A big brother or sister might love helping their sibling in EI. Still, at times they may feel jealous and say “it’s not fair!” that the child receiving EI services is getting special attention. 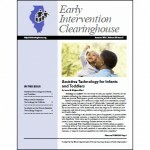 Families and their EI teams can plan ways to help siblings play and grow together. By involving siblings in the goals of individualized family support plans (IFSPs), all children—including the child with a disability—may benefit. For example, siblings can participate in speech therapy sessions. When siblings act as communication partners, they can help improve their brother or sister’s communication while developing a stronger sibling bond. Siblings can also be involved in playtime with their brother or sisters with a delay or disability. Siblings can be great role models for age-appropriate behavior. Sometimes, siblings without disabilities may need extra coaching to help them play and interact with their sibling receiving EI because she may not respond in the way the sibling expects of a playmate. Careful planning and targeted strategies can help make sibling interactions positive and fun. Consider a child in EI who is receiving supports for a physical disability. Throwing a ball back and forth may be difficult for this sibling pair, but an adult can coach the children to try rolling it back and forth. Or, consider a child in EI who is challenged in interpreting social cues such as body language. When a sibling holds a toy out to share, the sibling may not see this is an invitation to play. A parent may coach the sibling to include the words, “Share this dolly with me!” along with the gesture. First, find the best times for sibling involvement. Mealtime or playtime can be a good place to start. Begin by teaching siblings some ways they can engage with their brother and sister with a disability. Then you can show them how to help build new skills with their brother or sister by initiating conversations, inviting the brother or sister to play with them, requesting the brother or sister to share, and doing activities where they take turns. Also, siblings can give meaningful praise (“Meghan, I liked the way you shared your toy with me”) or physical guidance (“Vaden, let me show you the new cars we can play with”). This praise and modeling behavior can help a child in EI experience greater success and reinforce a positive sibling relationship. At times, siblings trying to help may be discouraged or struggle with connecting to their sibling with a delay or disability. When the strategies aren’t working, be a coach and encourage a sibling to try a different way or seek assistance from your EI team to try a new approach. 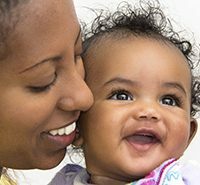 The Division for Early Childhood’s (DEC) Recommended Practices provide interventionists and families with information about the practices most likely to improve learning and facilitate the development of children birth to 5 years old. These practices are informed by research and experience. How can you use these practices? To support your own children. To evaluate whether your EI team is using these practices. Below are the 7 of the 10 family practices as well as examples of how you can implement these practices. Phase III, Year 2 continues to move forward as more people get involved in the SSIP activities in their area. Local leadership teams (LTs) in the three pilot areas (Aurora, Williamson County, and East St. Louis) continue to offer professional development and focused conversations around the Child Outcomes Summary (COS) process. We welcome everyone’s input, so if you have any comments, please e-mail them to cguillen@illinois.edu.